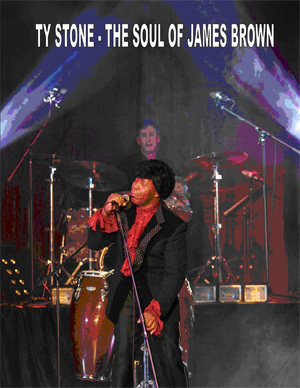 The Soul of James Brown is found in this authentic tribute to The Godfather of Soul by Ty Stone! He honors this amazing entertainer in a spectacular production as dazzling and elaborate as James’ own performances. His shouting vocals, feverish dancing, wardrobe, and unique rhythmic style are perfectly duplicated in this show, from a great band to go-go girls in the premium show. We can also provide the show with a digitally recorded track --- so “Get on The Good Foot!”, “Feel Good”, and “Get a Brand New Bag” with this amazing show!